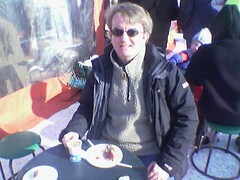 Jyjy called me on Saturday morning and proposed meeting for coffee at Hakaniemi market square. I had coffee and a pancake. It was a gloriously bright sunny day, and it felt great to sit outside in the sun. You wouldn’t believe it was -5°C! 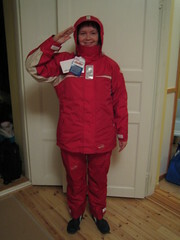 Eve was trying on her new sailing suit too – looks like it fits her OK. It has a thick fleece jacket zipped inside it, so it should be plenty warm enough when she’s sitting in the boat on its first trips of the season. Last Sunday Eve & I went for another walk on the ice. 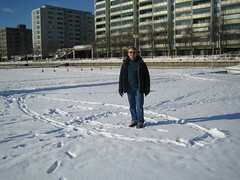 This photo shows where our H-boat will be moored in the summer – as you can see we can’t sail it there quite yet! Eve & I were very pleased when we discovered that we’d been assigned a mooring place on this jetty: it’s just 5 minutes’ walk from our flat, and easy for our friends to find too. Copyright © 2006 Journal. Powered by WordPress and A Dream to Host theme by Art of Blog.